The news that FlingSmash would be bundled with a MotionPlus-packing Remote landed the other day, but Gamestop swiftly removed the game page. Now Nintendo, in amongst all the 3DS news, has officially announced the new controller – a Remote with MotionPlus built-in – is on the way. Although no individual pricing or release date information has yet been released, the conference did at least confirm the Wii Remote Plus (called "Wii Remocon Plus" in Japan) will be available in one of four colours: white, black, blue and pink. They should have just done this from the start, but this "should" get the ball rolling so there are more MP+ games. I guess this was only a matter of time. Will be nice to have this before Skyward Sword is out next year. Lovely stuff! What's The Difference Between This and a Normal Wii Remote? Are you guys going to do a review on this in comparison to the current WM+? I would only consider getting these if they worked better than the current setup. Switching out the dongles is annoying, but not so annoying that it'd be worth selling my old ones and buying these. I love you Nintendo. All this great 3DS stuff and you still have more to give. 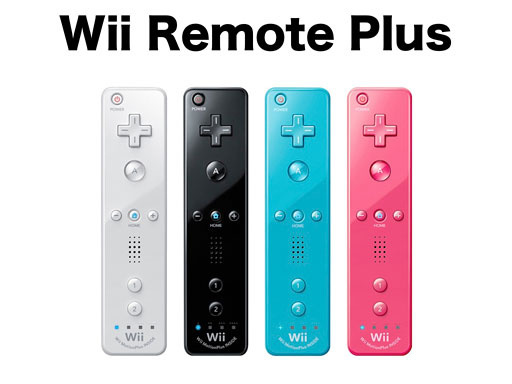 Does the new curved white text at the bottom say "Wii Motion Plus" or "Wii Remote Plus"? I wish the bundled remote with Wii Party was one of these. EDIT - Looks like it says "Wii MotionPlus inside"? This is AWESOME! I can't wait for these! Definitely gonna get the black one. Getting ready for Skyward Sword, maybe? Hope it's the same price as a normal remote - I could use a couple more. 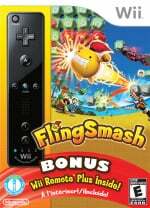 Did Nintendo confirm whether or not this will be bundled with FlingSmash as previously seen? I'm not sure if I'm buying this yet, because I already have 4 remotes and 2 Motion+'s (it's rare that you'll actually need more than 2.....), but if it's bundled with FlingSmash and there isn't an alternative cheaper version (actually, even if there IS an alternative cheaper version not bundled wit it possibly) I will probably get this anyway. (Unless, of course, FlingSmash ends up sucking). Cool, I am thinking of picking one up. A little to late or actually way to late. I allready have 3 remotes so ill propally just be getting one of these. I think they're doing this to promote 3rd party wii motion plus. If they make standard remotes with this at the same cost the games will be available without extra costs and we can get better quality motion control. dang it Nintendo, why didn't you just do this in the first place!? I can understand not having a gyrosensor at the launch of the console, but why didn't you just make it all one remote before you launched Wii Motion + and Wii Sports Resort, or at least release this alongside that adapter? I guess its a good thing I only have 2 remotes right now, even though two more wouldn't really help if there isn't more people to use them. Oh yeah, and how typical (again and again) to only release these four colors! But I won't go into that argument. i dont believe it. the colors anyway.. didnt nintendo put us on the impression all those colored wiis would come out?? @PSICOffee Totally. This is just like the time they launched the GBA only to release a better back lit one soon after. Is it the same length as the original Wiimotes? Oh well. Like others have said, it doesn't really change the fact that there's probably 1... maybe 2 quality games that even use Motion Plus right now. I guess I'm just upset that the only game I own that utilizes the dongle well is Red Steel 2, and even then, you're still just triggering pre-animated swings with gestures. Should of done this at the same time or instead of when the motion plus was released. That's good. I've already got myself a Wii Motion Plus (from Wii Sports Resort) though. Goood, I'm glad. While I appriciate the excess control abilities of the Wii MotionPlus, it's bulk makes it unwieldly for games played NES style, so removing and switching around can be a hassle. Yep, I'm defiantly going to sell all three of my Wii-Motes for two of these. The White Wii Remote Plus better have a smooth backing like the Standard white Wii remote when compared to the rougher backing that the Black, Pink and Blue Wii remotes have. For me it just feels awful, cheap and uncomfortable....Please be smooth! Wii Remote Plus: Now with 75% more calibration than the original Wii Remote, if you happen to have one of the 3 games that can support it.